Brickyard Kennedy once got scammed and was so embarrassed he fled home to Ohio, where he got scammed again. This is Extra Mustard’s Dead Dead Ball Ballplayer of the Week, a new feature we’ll have on Thursdays to help you get through the baseball off-season. Brickyard Kennedy was a pretty good pitcher for 12 major-league seasons in the late 19th and early 20th centuries, but that’s not why we’re writing about him. No, what makes Kennedy interesting is the time he was so embarrassed that he left his team and disappeared home to Ohio only to be embarrassed further. William Park Kennedy, also known as “Roaring Bill” but mostly called “Brickyard,” grew up in Bellaire, Ohio. He got the nickname because of the job he worked in the off-season. 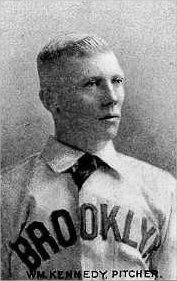 He made his debut with Brooklyn’s National League team (the precursor to the Dodgers) in 1892, and considering what happened next, it’s a wonder he stuck around for 12 seasons. In Kennedy’s final season, 1903, he was pitching for the Pirates in the first World Series when Red Sox fans serenaded him with an interesting chant. Is it possible they remembered the humiliating incident 11 years later? Take a back seat and sit down. And you ought to leave the town. Such as Boston’s pennant lifters. Phillipi, you are the only, only, only, one. After the 1903 Series, Kennedy pitched a few more years in the minors but by 1907 his career seemed over. According to Baseball Reference, Kennedy actually had a 5–1 record in 10 games during the 1907 season, and he even returned to pitch a bit for Dayton in 1908, at the age of 40. He kept pitching at the semipro level before he died of tuberculosis in 1915 at the age of 47.